This recipe is a ‘one bowl wonder’ only taking 5 minutes of your time. Best thing is, there’s hardly any washing up. You will find options throughout the recipe, including a gluten and dairy free option. Before we get going, this recipe is cooked in the microwave, however if you don’t like using a microwave you can simply bake in the oven on 180 degrees in oven proof dishes. Cooking times will vary greatly depending on size of dish. 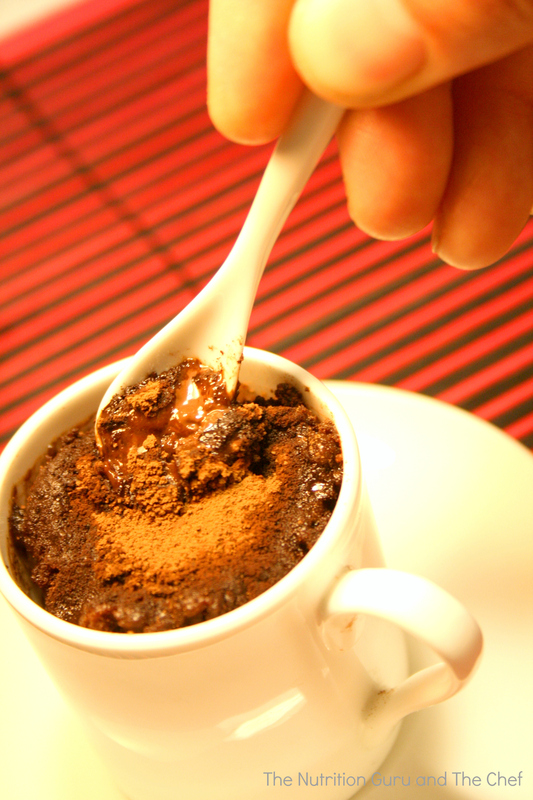 In a large bowl, place all dry ingredients (flour, natvia, cocoa) and combine thoroughly with a wooden spoon. Into this bowl, add the wet ingredients (egg, milk, oil, vanilla essence) and the chopped chocolate. Add the variations if using any. Divide mixture among 2 microwave safe mugs. Optional variation: Place a teaspoon of peanut butter in the centre of the filled mug and mixture YUM!). Cooking times will vary as microwaves settings are very different form one another. Cook on medium heat for 1 minute and check to see if cooked. Pudding should be firm but will also have a soft centre. Continue to cook on 10 second intervals until cooked to your liking. If using the oven,180 degrees in small oven proof dishes. Cook for approx 10 minutes though depending upon the size of the dish used, cooking time may take up to 20 minutes. KNOW SOMEONE WHO WOULD LOVE THIS RECIPE? SHARE IT! There are no words that can explain how delicious this was! Thank you for a great recipe! Oh thankyou so much! I’m smiling from ear to ear! makes us so happy to hear that! And it’s so easy to make isn’t it! Supposed to be working on a new post…. Might have to go on hold while I pop into the kitchen and whip this up for morning tea! Hahah! 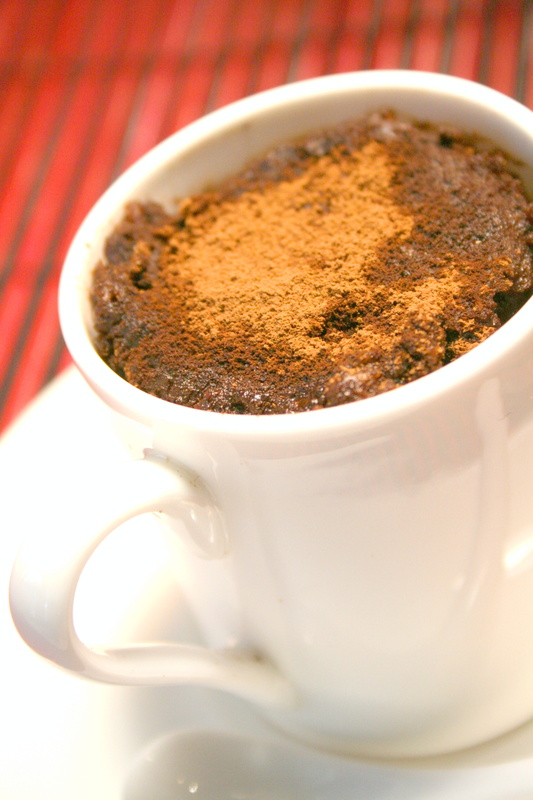 This cold weather lends itself to making delicious warm chocolate puddings! And the thing is, this recipe is TOTALLY distracting because it is so quick to make! That’s a great tip thankyou! we were so excited when we developed this, and the chef always begs me to make it for him. And the good thing is, that I can..because it takes no time at all! Thanks for the info and feedback!